The recent release of “Fragments” finally put David Andrew Wiebe back on the map as a recording artist. Prior to that, his only official solo release was his solo debut, Shipwrecked… My Sentiments in 2006. His only “unofficial” release after that was Demos 2010 in 2011. In May 2016, Wiebe finally made a return with “Fragments”, a jazzy guitar instrumental. Fans were pleased to see Wiebe back at it after all these years. Not content to sit still, Wiebe issued “City Lights” as his latest single on June 28, only a month after the release of his last single. Synthwave originally emerged in the mid-2000s, but still has an engaged following today. FM-84’s Atlas, for example, was just released towards the end of April here in 2016, and is getting rave reviews. Wiebe’s discovery of Synthwave was almost accidental. He has a habit of listening to electronic mixes on YouTube while working, and one day YouTube automatically loaded up a Lazerhawk album after a separate mix had ended, and Wiebe intuitively recognized it as new music with a retro spin. @davidawiebe Hey David didn’t know you were into synthwave stuff. My faves @TheMidnightLA and @fm84. Check ’em out of you haven’t already. It was thanks to this tweet that Wiebe finally became aware of what it was he was actually listening to. 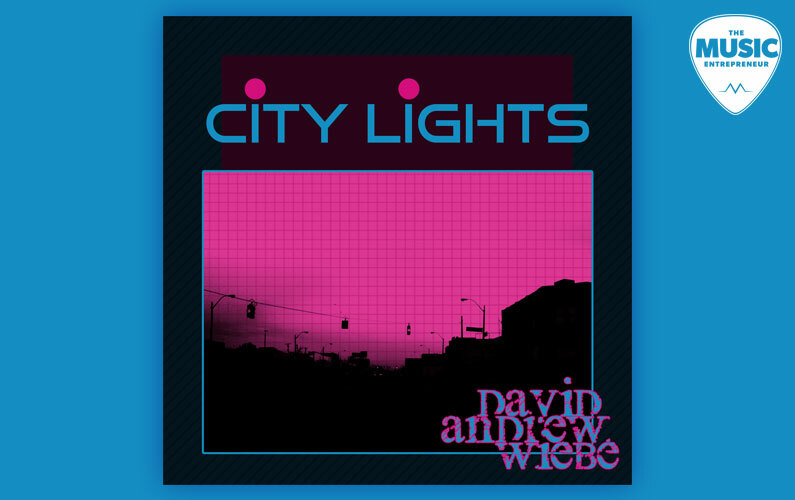 “City Lights” is indeed a Synthwave-inspired composition – which is oddly meta, since Synthwave was inspired by 80s soundtrack music, so this would make Wiebe’s release… New Synthwave? In any case, if the retro-inspired neon artwork doesn’t give it away, the music most certainly does. The single does feature a guitar solo at the midway point, a solo Eddie Van Halen himself could have hypothetically played, if the single had been a mainstream release from the 80s. But more than that, the centerpiece of the music is really the layered synth parts and sounds Wiebe meticulously composed and picked out. Moreover, guitar isn’t always a major focus with Synthwave music. Ultimately, anyone that lived through the 80s will instantly recognize “City Lights” as being a head nod to the past. But does Wiebe fancy himself a Synthwave artist? Is this something he intends to pursue for the foreseeable future? Wiebe, as an artist, and as a fan of music, has a variety of different interests. While melodic rock/power pop remains a favorite of his, he has yet to announce a release that coincides with these particular genres. Perhaps, all in good time.